With all the temptation of pig butchery and bacon lattes, we've been neglecting the other white meat. But, frankly, there hasn't been much to report about chicken—that is, until we found some fried extra crispy atop a golden waffle and glistening with a thick drizzle of brown-sugar syrup. 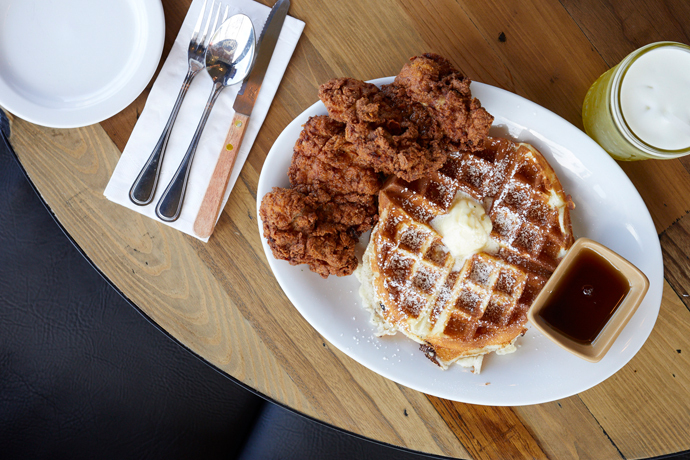 Welcome the much anticipated, and long-overdue Gussie's Chicken & Waffles—your new soul food haven that's putting poultry back on the map—slated to open Friday in the Western Addition. Brought to you by chef/owner Michele Wilson, a vet from Roscoe's House of Chicken and Waffles, Gussie's (named after her grandmother, the brains behind the eatery's heirloom recipes) will satisfy your soul food, breakfast-for-dinner needs, one heap of fried chicken and waffles (buttermilk, buckwheat, sweet potato, banana pecan or cornmeal) at a time. Formerly home to Powell's, Gussie's is like your grandma's home if she lived in the Low Country and whipped up fried chicken, black-eyed peas, collards and candied yams every night. Take a banquette under the slow-moving ceiling fans and family photos hung on the chocolate-colored walls, order the signature homemade brown-sugar syrup topped dish, then spice things up as you forgo the usual can of beer pairing for the Sweet Sticky Thang—an apple-infused soju, lime and pineapple juice cocktail with hot caramel rim. 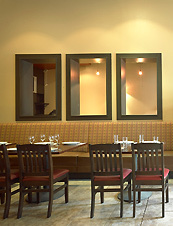 Or perhaps go in for something more classic like margaritas made with agave wine, or a dry sauvignon blanc. After all, we are in California.